This is a real B movie. I saw it many years ago at the local Jubilee Cinema in the town – now no longer there – as a very young boy and seem to think there was a Bowery Boys film on with it. Johnny Sheffield had been cast as Boy in the Tarzan series with Johnny Weismuller but by the late 40s both were getting too old for their parts. Johnny Sheffield then accepted the part of Bomba The Jungle Boy in a series of 12 films- all made very much on the cheap by Monogram. They were mainly filmed on indoor studio sound stages and in and around the eucalyptus trees of the Santa Anita Botanic Gardens in Los Angeles and possibly the director’s back garden ! However they appeared to be good fun and juvenile audiences liked them – that’s probably why so many were made. 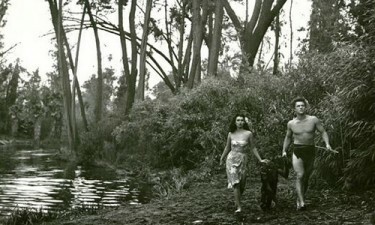 After the Bomba series ended he tried to get a TV show called Bantu the Zebra Boy going – indeed a pilot episode was made but it failed to catch the TV people’s interest so he left acting and set up in property and apparently did quite well to such an extent that for some time he lived in Pacific Palisades but died in Chula Vista Southern California. Johnny Sheffield’s death in October 2010 at the age of 79 came after he had fallen out of a tree he was trimming which resulted in him having a fatal heart attack about four hours later - ironic really for a man who had made a long career swinging through the treetops. B Movies were an essential part of cinema life through the forties before fading out in the mid fifties. They were usually made for between 70 and 80,000 dollars and the aim was to bring in a profit of say 10,000 dollars. Sometimes they did hit the jackpot though. They relied on studio bound sets and stock footage from newsreel and older films. Lord of the Jungle from 1955 was in fact the very last of the 12 films in the Bomba series – after this one Johnny Sheffield never made another film. For his contribution to the motion picture industry, Johnny Weissmuller has a star on the Hollywood Walk of Fame at 6541 Hollywood Boulevard in Hollywood – and so he should have ! 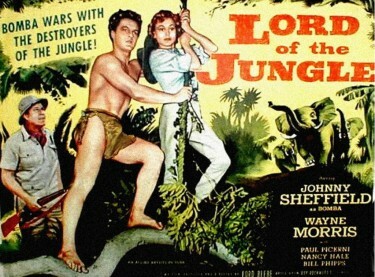 Lord of the Jungle from 1955 with Wayne Morris. Wayne Morris played the villain in this although apparently he does not appear that much in it. He does however share star billing with Johnny Sheffield which was understandable because he was a well know movie actor. Wayne Morris had developed quite a good movie career before the war. Following the war, Morris returned to films, but his nearly four-year absence had cost him his career. He continued to act in movies, but the pictures generally were not of the best quality and in the early fifties he was playing in mediocre westerns. He did come over to England in 1955 to make Cross Channel and The Gelignite Gang – which gets a very good review. He had started a TV career in Westerns but this was was cut short when he died unexpectedly of a heart attack at the age of 45 on September 14, 1959. Morris had been a guest of his World War II commander and was watching aerial maneuvers on an aircraft carrier when he died.